Jalopnik only touched on the prices/options. And plus I like doing this price and option break downs on new models. Gives me something to do while bored at work. But here’s the full breakdown. But its a little more complicated than just choosing a trim. The Twin Turbo V6 is only available on the Standard, Reserve and Black Label trims. The Twin Turbo Hybrid V6 is only available on Grand Touring and Black Label Grand Touring trims. Ill do pricing for all models. AWD is a $2500 option. I stuck with Black of course. Windshield de-icer with heated VisioBlade wipers. I added this because heated rear seats comes in handy on cold mornings. There are also no wheel options except the standard 19-inch option. Interior color options are pretty limited at this trim as well with the only choices being ebony and sandstone. Both are no cost options. All in a Standard trim Aviator will set you back $53,195 give or take. Depending on if you choose one of the $650 exterior color options. Add on $2500 to that if you add awd. For some reason on this trim, awd is $10 bucks more. Maybe it has something to do with the wheels being an inch bigger than on the standard trim? I’m not sure but I couldn’t find a reason for it. On this trim there are 2 pretty pricey interior options that can make the interior even more luxurious. Second row captains chairs with full rear console with controls for the Vista Roof shade and 2 USB ports. 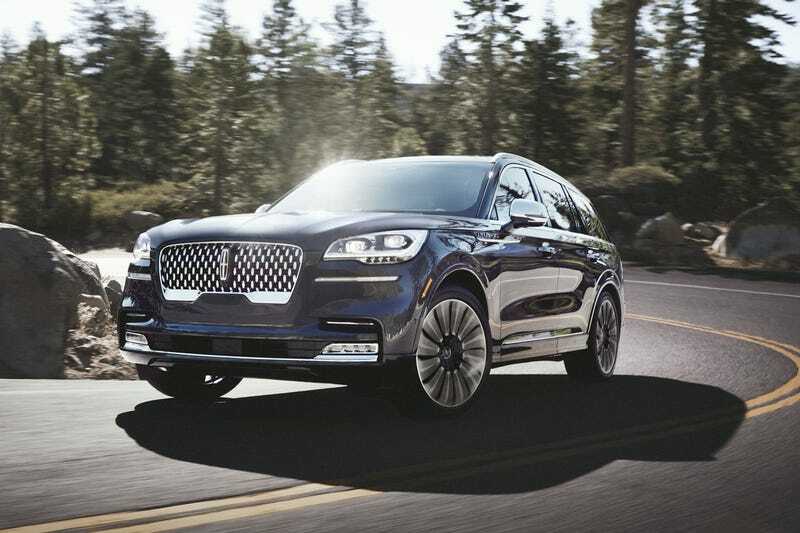 Lincoln Co-Pilot360 with adaptive cruise control, active park assist, lane centering, speed sign recognition, evasive steering assist and reverse brake assist. Revel Ultima 3D audio system with 28 speakers and rear door sunshades. Unfortunately you cant add both of these, only one or the other. Adding Reserve II automatically adds on AWD, so I added on Reserve II. Keep in mind this package comes standard on Black Label Grand Touring. I added this as well. Not $2000 worth of options to me, but I added it nonetheless. Other than the standard 20’ wheel, the only option is a 22’ wheel that’s included with the Reserve II package. Interior color choices a slightly better at this trim, with a total of 4 being available: ebony, ebony roast (black/brown),slate gray and sandstone. All are no cost options. All in, depending on how you option it, a Reserve trim Aviator is just under $75 grand with the options I selected. Pricey for sure. And just getting started. All are no cost options. I choose Flight because it seems to go better with the Black exterior color. AWD is standard on Black Label trim as well. RWD isn’t even an option. Exterior color wise, the Black Label only gets a choice of 6 exterior color choices that are different from the standard colors: Infinite Black, Flight Blue, Chroma Caviar Dark Gray ($1,750), Burgundy Velvet, Pristine White, and Silver Radiance. From what I saw, not all colors can be chosen. Depending on which Theme you choose, you can only choose certain colors. Black Label also has the same option packages which are for the most part standard since this thing comes pretty loaded. Interior leather choices differ of course depending on which Theme you choose, with the main difference being color and perforation. All trims come with Savannah leather, but Chalet comes with Diamond Weave, Flight comes with Runway, and all others come with a Lincoln Star perforation. All in. A loaded Aviator Black Label comes in at $78,790. The Hybrid models are even pricer and differ in a few ways. The base Hybrid model is the Grand Touring trim. It comes standard with AWD and has the same paint options as the non Hybrid trims. The differences start at the Packages. There are 2 on this trim. The first, a $7,680 Grand Touring I package, consists of...well honestly, there was nothing about the package I could see that would make it cost $3,290 more than the Reserve I trim on the non hybrid Reserve Trim, which this package is comparable to. The same goes for the $15,375 Grand Touring II package which is $3,750 more than the comparable Reserve II package, I don’t know if Lincoln thinks they can charge more just because or what but it doesn’t make sense. I choose this one though since it includes pretty much everything. There are really no other options for this trim, and all it in rings in at $83,670. The top of all the trims is the Black Label Grand Touring Hybrid. Its loaded with the only options on it what Theme you choose and which extra cost paint you choose. That rings in at $88,895. The Aviator looks ready to do battle with the best from the Germans and Japanese, and base on interior quality and design alone looks to blow the Cadillac XT6 out of the water with American Luxury done right.